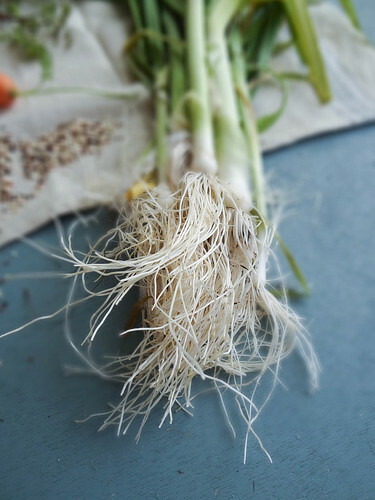 Tender leeks are roasted with tender little carrots. 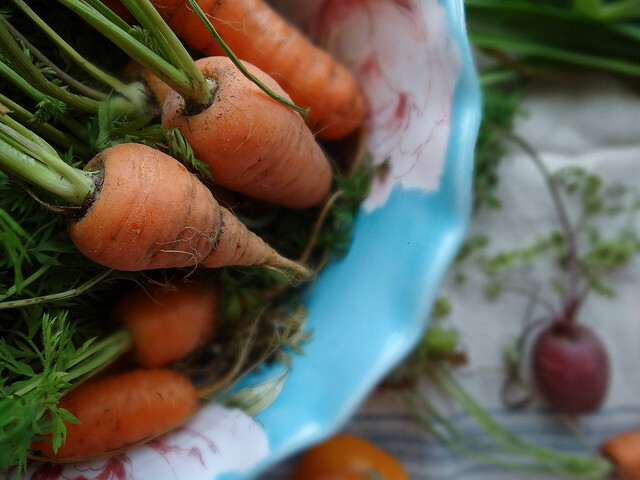 Isn't it amazing how "orange" a freshly pulled carrot tastes? There is nothing to compare it too - it is just so carroty! 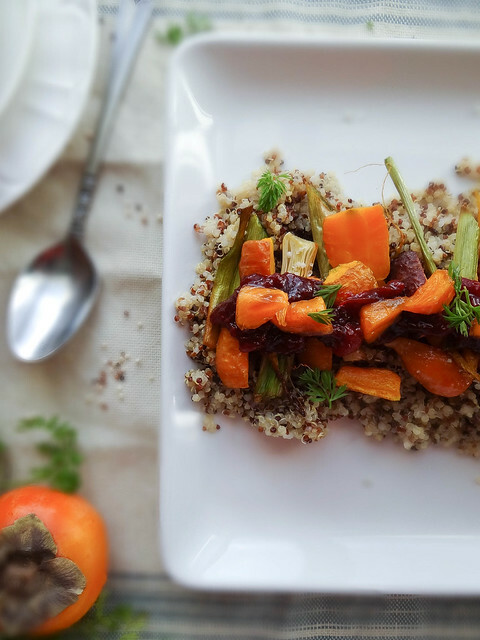 After the carrots & leeks are roasted they are tossed with a simple tri color quinoa and topped with cranberry chutney & fresh persimmons and sprinkled with a few carrot fronds. I love the tart flavor with a hint of sweetness the cranberries add to the overall dish, the color contrast is quite nice too. 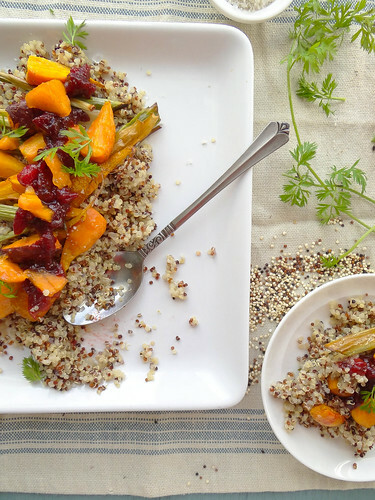 This salad managed to hit on all the things I was looking for in a "post holiday" meal. 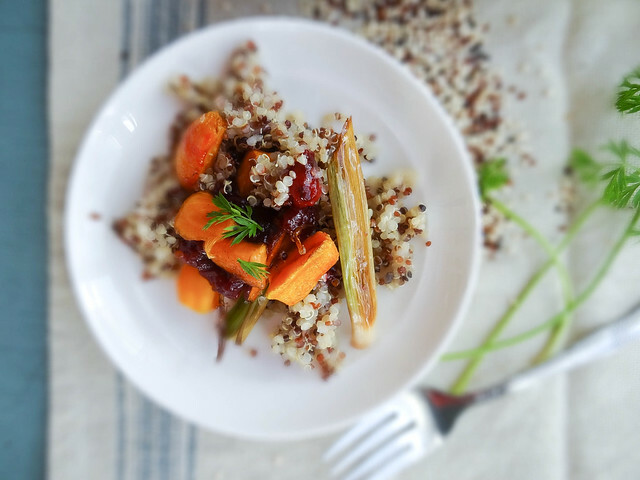 Healthy vegetables, good protein from the quinoa & antioxidants from the cranberries. Can I tell you something? Up until this day I had never tasted a persimmon! Wow, the flavor & texture was completely unexpected - it was incredible, I think I may have found my new favorite fall fruit. 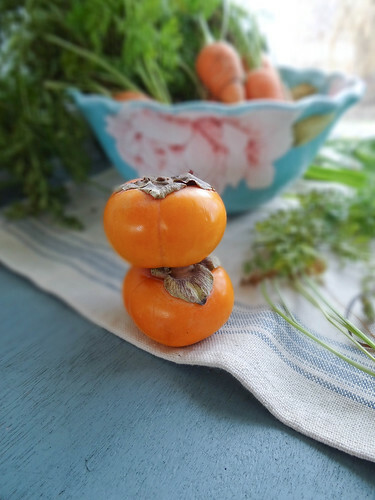 What is your favorite way to use persimmons - I need ideas! Do you have a ritual after the Holiday's Detox? prep veggies and spread evenly on a rimmed baking sheet - toss with canola oil and roast for 25 minutes until tender and caramelized. 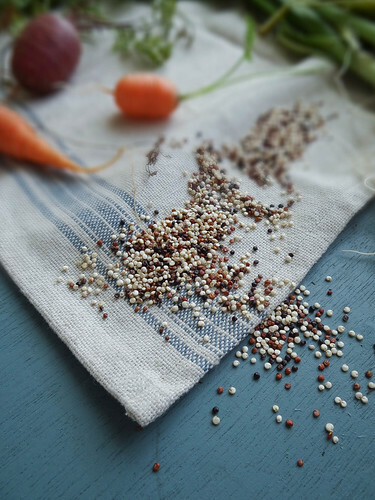 in a medium sauce pan, bring 2 cups of water to a boil- add rinsed quinoa. reduce heat to a simmer and simmer for 10 minutes. turn off burner and allow to sit for 10 minutes prior to removing the cover. 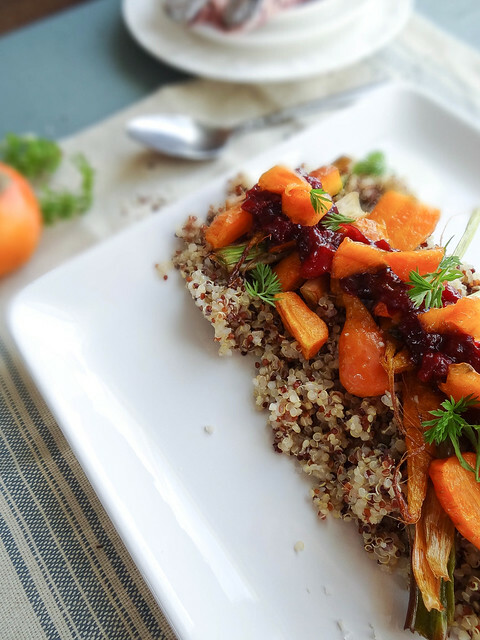 to assembly the final dish - spread the cooked quinoa on the bottom of your serving dish, layer the roasted carrots and leeks on top of the quinoa, spread the cranberry chutney over the roasted veggies, sprinkle with persimmons, fronds & salt. to make your own chutney, place 1 bag of cranberries in a sauce pot, add 1/4 cup orange juice, 1/2 cup coconut sugar & a small dice jalapeno - boil until cranberry mixture thickens & sugar dissolves. that is one superbly beautiful salad, heather! 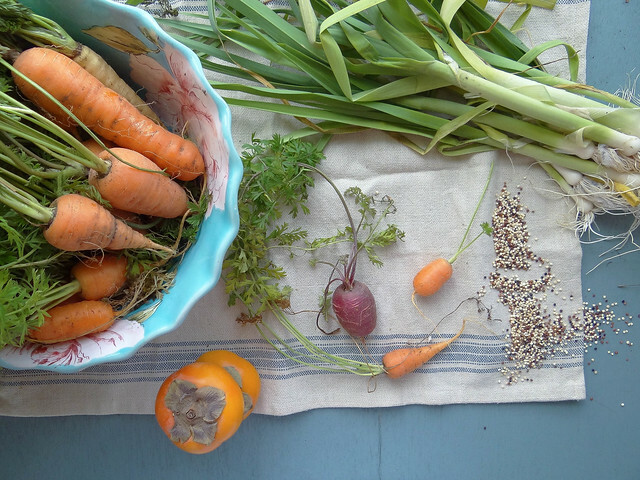 i can't wait to have a garden next year so i can relish in the beauty of homegrown vegetables. This sounds so fresh and light. Perfect for post-thanksgiving. :) Love the colors too. I still need to try persimmons! the photography here is so gorgeous! 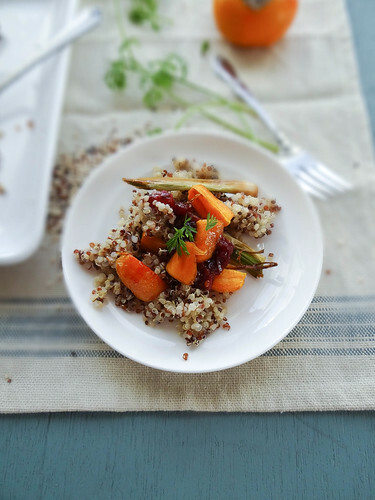 I really love the shot of the carrots! and the salad itself is so beautiful, I love all the holiday flavours you incorporated! I'm not a big persimmon fan so I'm no help there, but I can't wait to see what you come up with! Wow! I really need to get that many colors on my plate more often! Beautiful :) So many gorgeous colours! 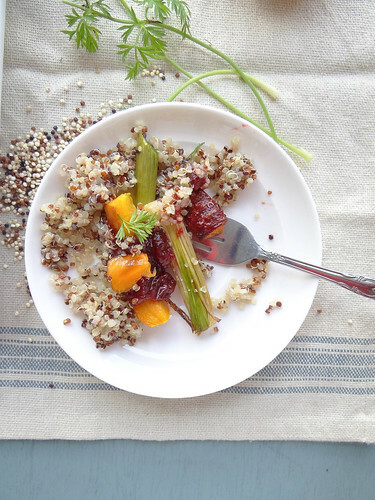 What a great idea to add some cranberry chutney to the quinoa. I need to try persimmons too! What a pretty and festive looking dish! 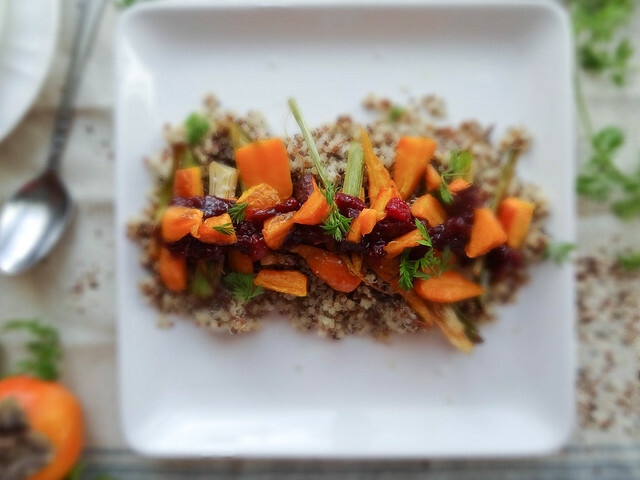 I've had cranberry chutney on my mind lately and was actually planning on making a salad tonight with a cranberry chutney dressing! I love that you added persimmons _ I just discovered them after trying them at a hotel breakfast buffet, and I've been meaning to buy some for myself. all those colors are looking so beautiful! and gorgeous pictures heather. very crisp colors and clean and pretty. i'd eat this beautiful salad every day. I'm so surprised that this is your first persimmon experience. They can be really good or really bad! I bought some from whole foods once that were so terrible and chalky tasting! Of course they are most delicious ripe from the tree. That salad is looking crazy good! This looks positively heavenly, Heather!